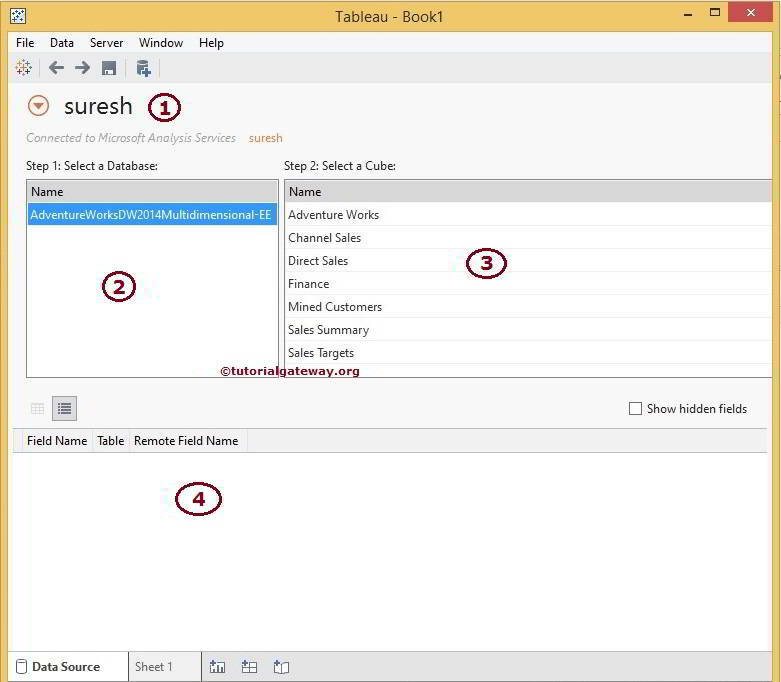 In this article, we will show you, The Steps involved in connecting Tableau to Microsoft Analysis Services. 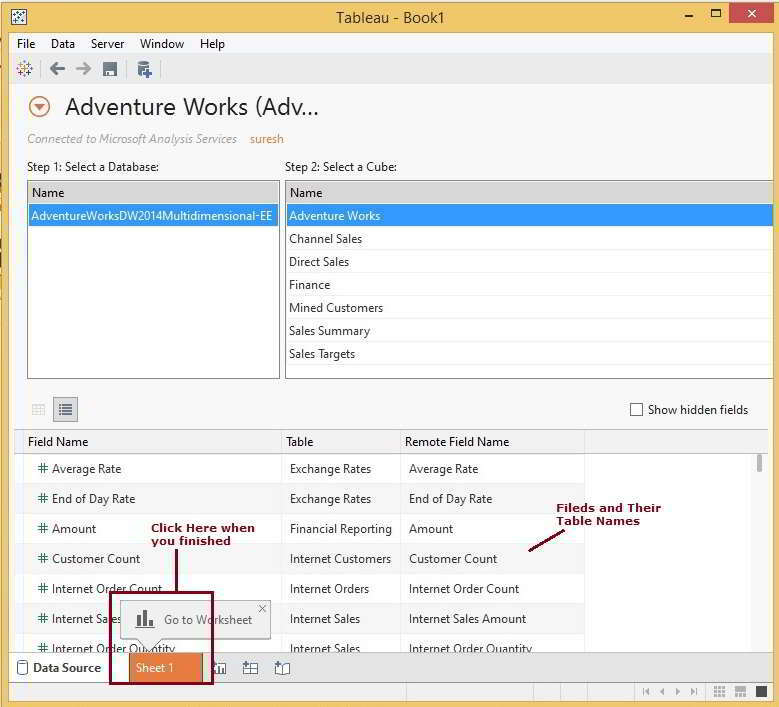 In addition, how to use the data present in Cubes as Tableau Data Source with an example. 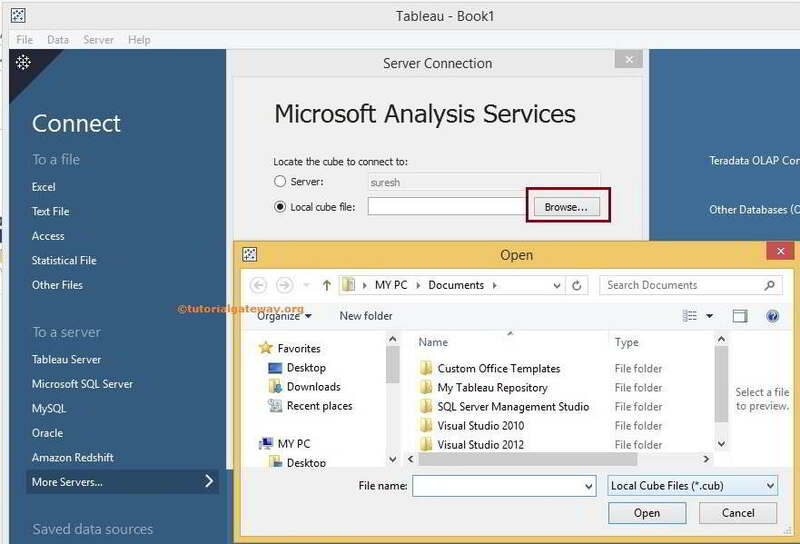 Once you selected the Microsoft Analysis Services Option, a new window will open to configure the Server Connections. Local Cube File: If the Cube file is in your file system then select this option. 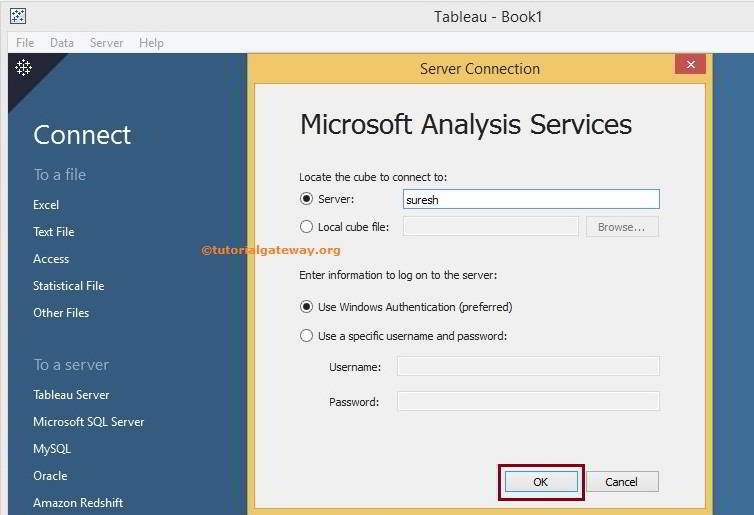 Enter information to log on to the server: Use this section to decide how you want to connect with Microsoft Analysis Services. If you want to use the current windows login credentials then select Use Windows Authentication option otherwise, Please select Use specific Username and Password option and specify the credentials (Username and Password) to access the SQL Server. If you want to choose the cube file from local hard drive then select Local Cube File option. Once you selected this option, the Browse button will enable to navigate us the entire file system as shown below. You can download this Cube from Microsoft official Download Center. This section will display the Instance name we used to connect with the Microsoft Analysis Services. 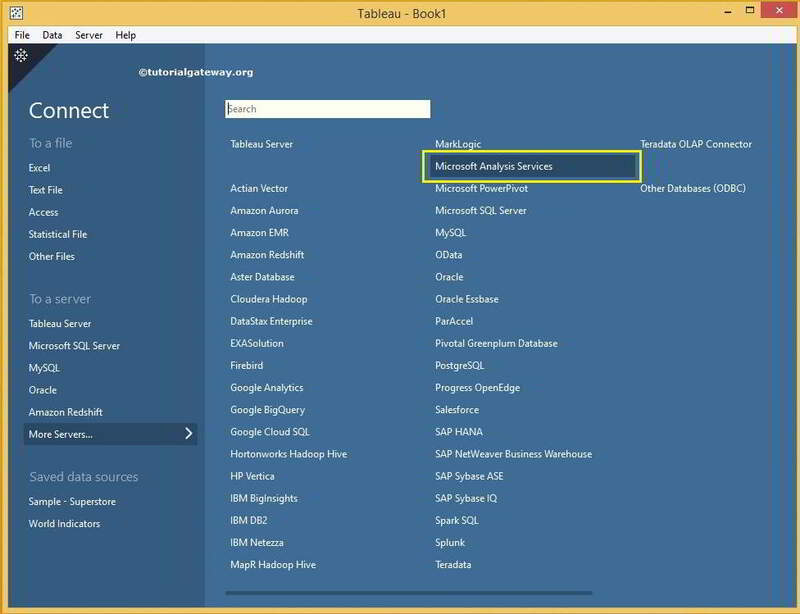 Select a Database: This section will display the list Microsoft Analysis Services Databases available for that instance. 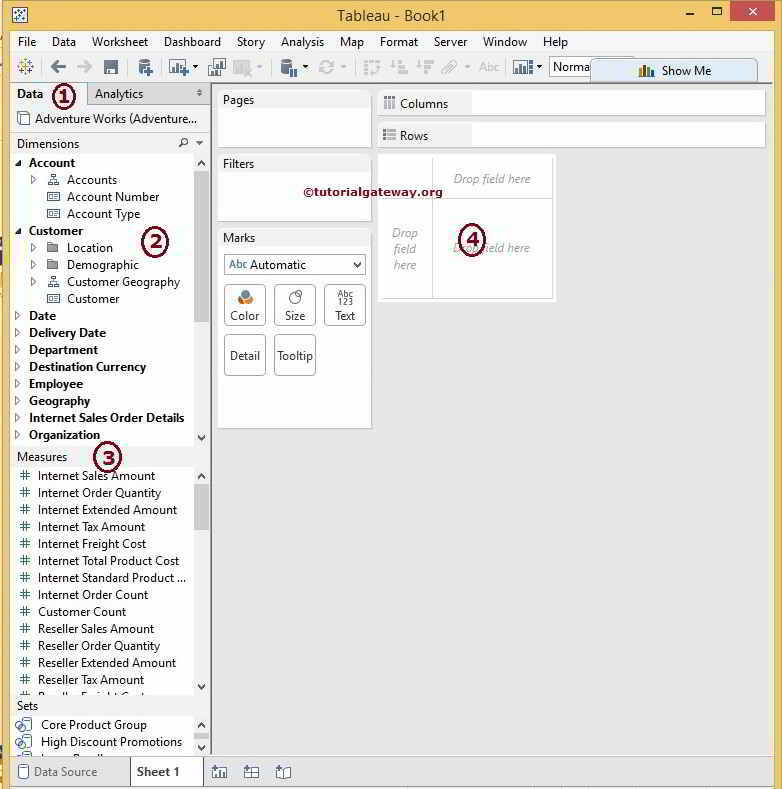 Select a Cube: This section will display the list of Cubes present in selected Microsoft Analysis Services Database. This region will display the Measures and Dimensions available in the selected cube. Under the Database section, We have to select the required Database available in that Instance. In this example, We have only one Database so, we are selecting an AdventureWorksDW2014 Multidimensional database. Under the Select a Cube section, We have to select the required Cube available in the selected database. In this example, We are selecting Adventure Works Cube. Once you selected the required Cube, Region 4 will display the Measures and Dimensions available in that cube.